Part Used : Roots, Leaves, Fruits, Seeds. Habitat : Throughout india in deciduous forests and in moist areas. Uses : The roots are sweet, astringent, bitter, acrid, refrigerant, expectorant, digestive, carminative, febrifuge, diuretic, antimicrobial, antifungal, anti-inflammatory and tonic. They are useful for vata and kapha, dropsy, flatulence, colic, diarrhea and dysentery. Stem bark paste is applied for the cure of scabies and to treat arthritis. Leaf decoction is given in treating stomachache, ulcers, rheumatism pain and enlarged spleen. Mature fruits are useful in treating cough, bronchitis, piles, jaundice dyspepsia, smallpox, colic, leucoderma, pharngodymia, cardiac disorders, gastropathy, hemorrhoids and cholera. Seeds are used as purgative. 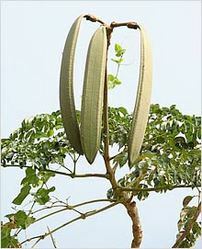 Dried seed powder used by women to induce conception. Seeds yield non-drying oil used in perfume industry. Stem bark and fruits are employed as mordent, the stem bark yields a khaki color dye. The decoction of the roots is commonly used for arthritis. Used externally as a paste of its skin of roots, it dries up the discharges and promotes the wound healing.